“I have a duty towards the people and that’s why I have come to politics,” Tamil superstar Rajinikanth said on Monday during his maiden political speech after announcing his entry into Tamil Nadu politics. The ‘Thalaivaa’ rebutted his political opponents and entertained the crowd with his famous dialogues during his 35-minute speech. The ‘superstar’ showered lofty praises on the reign of AIADMK founder and former Chief Minister MG Ramachandran. However, he didn’t drop any hints about the launch of his political party. Rajinikanth had announced his much-awaited entry into the political arena amid a lot of fanfare in December last year. He had said that he would join politics, and field candidates in all 234 Assembly segments in the upcoming general elections in 2019. The ‘Thalaivaa’s’ maiden political speech came at the unveiling of a statue of the late Tamil Nadu Chief Minister M G Ramachandran at Dr MGR Educational and Research Institute in the presence of a huge crowd in Chennai. He also advised students to work hard for four years so that they could reap the benefits for the next 40 years. 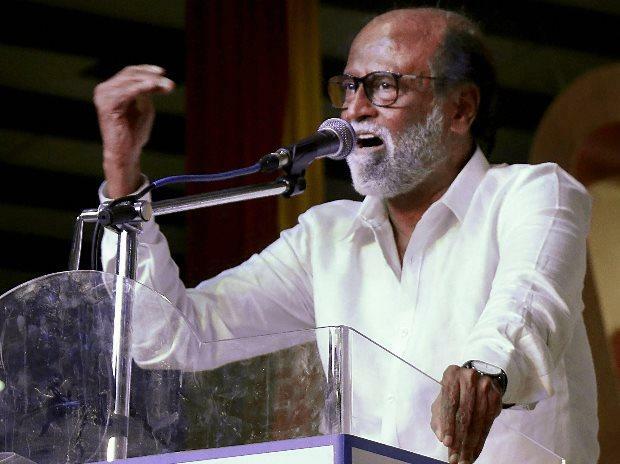 Rajinikanth’s speech also sparked an outrage among Chennai residents as his supporters erected banners and ‘illegal posters’ that disrupted traffic in the southern metropolis. Kamal Haasan took a dig at the superstar for the same. Rajinikanth said that his political philosophy would be that of ‘spiritual politics’, explaining that honest and casteless politics meant spiritual politics. This is not the first time that he spoke of ‘spiritual politics’. When he had announced his entry on the plank of a new brand of politics in December, DMK leader M K Stalin had said Tamil Nadu was the cradle of the Dravidian movement, where there was no place for ‘spiritual politics’ as enunciated by the superstar. “With my close relationship with M Karunanidhi, G K Moopanar and others, I learnt a lot about politics,” Rajnikanth said. Politics is a way where there are snakes, thorns and difficulties. The superstar also said that he planned to use technology and talented people to deliver good governance. Announcing his political debut on December 31 last year, Rajinikanth had said he would bat for honesty in politics and good governance. Rajinikanth’s speech was peppered with punchlines from his films and offered a point-by-point rebuttal of the criticism hurled at him. Wearing a white shirt and dhoti, he exhibited a mix of softness and aggression during his 35-minute speech. Sporting a grey moustache, beard and a black spectacle, the actor was at his best when he gave his trademark laughter as an answer while anticipating a political repartee to his adulation of MGR.